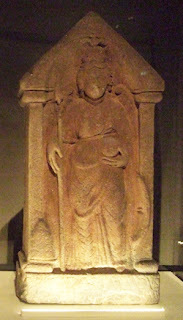 Brigid is one of the most popular Goddesses with pagans of the 21st century. I suspect the Celtic Goddess of poetry, the forge and healing wells particularly appeals because she has so many roles, extending beyond those perhaps traditionally assigned to women. It feels good to honour a goddess who might fix your car as much as she might inspire your creative writing and help make you feel better when you are unwell. A new book in the Pagan Portals series - Brigid: Meeting The Celtic Goddess of Poetry, Forge, and Healing Well - offers a well-researched insight into the history of Brigid as well as ways for modern pagans to honour her in ceremony and prayer. Pagan Portals - Brigid is a basic introduction to the Goddess Brigid focusing on her history and myth as well as her modern devotion and worship. Primarily looking at the Irish Goddess but including a discussion of her Pan-Celtic appearances, particularly in Scotland. Her different appearances in mythology are discussed along with the conflation of the pagan Goddess with Catholic saint. Modern methods for neopagans to connect to and honor this popular Goddess include offerings and meditation, and personal anecdotes from the author's experiences are included as well. Who was Brigid to the pre-Christian pagans? Who is she today to neopagans? How do we re-weave the threads of the old pagan Goddess and the new? Learn about Brigid's myths among the pagan Irish, the stories of Bride in Scotland, and the way that people today are finding and honoring this powerful and important deity to find the answer. Author Morgan Daimler says in her introduction: "Pagan Portals: Brigid was written as a resource for seekers of the pagan Goddess specifically and offers both solid academic material and anecdotes of connecting with Brigid in a format that is accessible and designed to be easy to read." I am sure I will be referring to this book in the future for rites to honour Brigid - or Brigantia as she was known in England. Pagan Portals - Brigid: Meeting the Celtic Goddess of Poetry, Forge, and Healing Well can be ordered via Amazon.